Never underestimate the lean protein power of ground chicken. Almost every recipe that calls for ground beef can be substituted with ground chicken (or turkey). Preheat oven to 350°F. Coat a 12-hole muffin tin with cooking spray and set aside. In a large skillet, warm oil over medium heat. Add garlic; cook, stirring constantly, 1 minute. Add ginger; cook, stirring, for 1 minute more. Add mushrooms; stir to combine and scrape bottom of skillet with a wooden spoon. Add soy sauce and sherry to deglaze skillet; cook, stirring occasionally, about 5 minutes more. Add scallions; cook, stirring, until wilted. Stir in cilantro; turn off heat. Place chicken in a mixing bowl; add mushroom mixture and combine thoroughly. Fill each muffin hole with about 1/2 cup of chicken mixture shaped into a ball with your hands. Bake until juices bubble up clear, about 35 to 40 minutes. Meanwhile, to prepare dipping sauce, in a small bowl, combine preserves, water, lime juice and fish sauce. 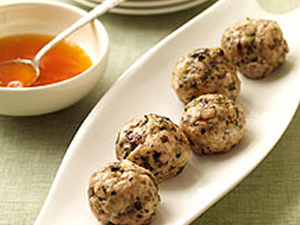 Serve chicken balls with dipping sauce on the side. This entry was posted in Chicken, Entrees, Metabolic Medical Center Recipes, Modified Profast (Fast and Flexible) Recipes, Nutriplus Recipes (Balance Your Pyramid), Party & Entertaining, Salad, Uncategorized, Vegetables and tagged Chicken, easy, ground chicken, home made, Metabolic Medical Center Recipes, side dish by foodies4mmc. Bookmark the permalink.